Vegetarians on Oahu will have no trouble navigating the Oahu restaurant scene for healthy, veggie fare. In fact, Oahu has a variety of different restaurants that cater to vegetarians, vegans, and those on gluten-free diets. However, many restaurants that don’t advertise themselves as “vegetarian” also offer some meat-less options. And, many Oahu restaurants offer “self-serve” and “customized” meals that can accommodate vegetarian diners. 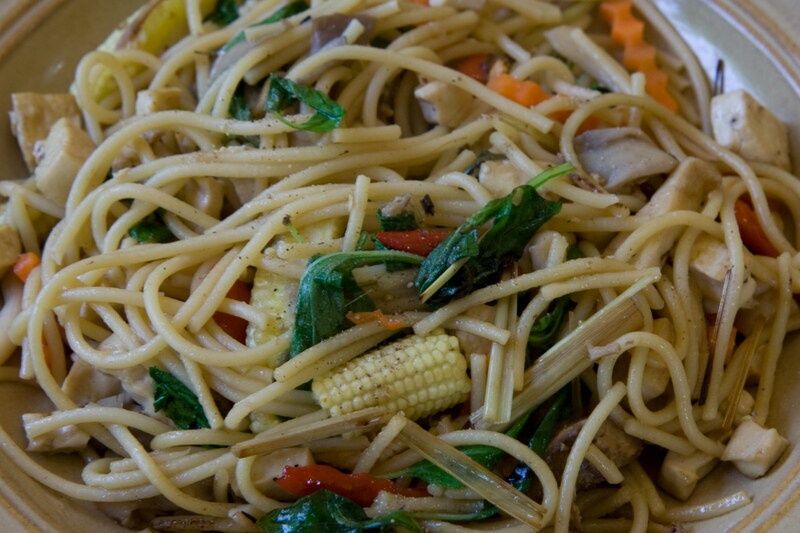 Because Hawaii has a large Asian influence, you can usually find vegetarian noodle dishes at a variety of restaurants. Honolulu now has six 100% vegan restaurants. They are Peace Cafe, Loving Hut (two locations), Simple Joy, Greens and Vines, and Eden on Earth. All Thai restaurants have many vegetarian and vegan options. Nearly all have brown rice. Nearly all, however, use fish sauce, and their red and green curry sauces contain shrimp paste, unless homemade. Suggestion: order the green curry vegetables but have them with yellow curry sauce. 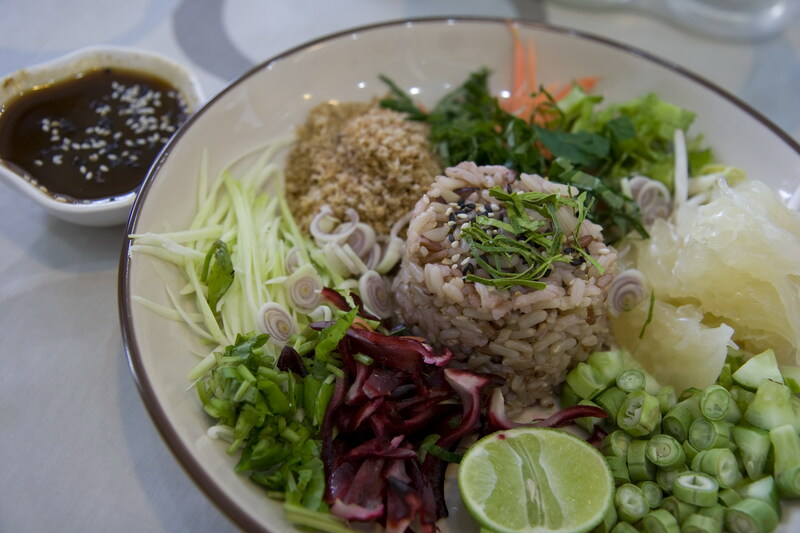 Most Vietnamese restaurants have vegetarian sections on their menus and may offer brown rice. Request no fish sauce. Most offer vegan pho (made with vegetable broth) and vegan summer/spring rolls, even if not on their menus. Most Chinese restaurants will prepare whatever combination of ingredients you request. Tell them what vegetables, noodle, or sauce, e.g., bitter melon with look fun noodles and black bean sauce, you wish. Request no chicken stock. You may also request reduced soy sauce and oil and no MSG. This does not apply to preprepared foods like soups, dumplings, and spring rolls. Increasingly, Chinese restaurants offer brown rice. Most Italian and many continental restaurants have one or two pasta primavera dishes (or can readily prepare one on request). Vegans must be wary of egg in the pasta and dairy in the sauce. You may ask for reduced oil. All Korean take-out places offer vegan vegetable choices. The “vegetable plate” consists of four vegetable selections and white rice. The “vegetable plate without rice” allows five choices. Selections, quality, and portions vary widely among locations. Many restaurants have good to excellent salad bars and plain baked potatoes. At build-your-own sandwich shops, you may choose whole-grain bread and vegetarian/vegan/low-fat contents. Suggestion: you may build an over-spiced sandwich and eat it at home with steamed vegetables. The Mexican fast food chains Taco Del Mar (6 locations) and Maui Tacos(2 locations) allow you to build your own meal, much like the sandwich shops. Components that appear to be vegan (beans, guacamole, etc.) are purposely free of non-vegan components (lard, chicken stock, egg, etc.). A variety of named salad shops (like Aloha Salads) can be found in malls and supermarkets. Asian-inspired vegetarian dishes are available at many restaurants or you can customize your meal at non-vegetarian restaurants. Jamba Juice has 25 locations on Oahu. Most of the menu is vegan or vegetarian. Their smoothies have no artificial colors, preservatives, or flavors. Zippys has 24 locations on Oahu. Local food. Vegan tofu burger & vegetarian boca burger. Their vegetarian chili is vegan, with negligible added fat or sweeteners. It is the same as that sold frozen in markets, where the ingredients can be read. Brown rice is available at all locations. Almost every decent restaurant in Honolulu has at least one or two vegan items on their menu. Phone them and be surprised. You certainly won’t go hungry if you’re looking for vegetarian fare on Oahu. The vegetarian movement is becoming increasingly popular among residents and visitors—so, the variety of restaurants serving vegetarians on Oahu is likely to get even better!